Servo voltage stabilizer is a reliable power control device that gives perfect output of electricity to meet both domestic and industrial equipment applications. When there is unbalanced voltage coming at input, then with quick current correction, Servo Stabilizer will balance the input and give the perfect power supply to the secondary. It is the best option to protect industrial gadgets and power gear like lifts and elevators. Servo Stabilizer is no doubt the right choice to give your lifts a safe input volt faster than a normal transformer could give. Elevators need immense power to drive their movement and the motor has to be given exact input supply or else sooner or later, you can experience trouble in motor working, damage to the coils and incorrect voltage can even damage the elevator systems. So precisely, motor operations can be hampered and power quality issue may arise. Commercial elevators have apparently solid motor strength ranging from an extensive horsepower of 15 through 50hp and it runs on 3-phase electricity. They have thermal overload thermostat and the voltage to run the motor starts from 200. It can reach between 200-230 and a step-up motor would be 460 or 575 volt. Residential elevator motors are also strong but their strength is somewhat lower than commercial lifts. They might have a lower horse power and can come in single or 3 phase supply but the volt usage is similar. Empirically, the most common faults that elevators encounter include problem with power control. Due to irregular flux like over/under voltage, lift motors are an easy prey to damage. They can overheat or weaken their magnetic current rotation. As a result, it might lose a phase and stop working. These lifts can face common power glitches unless a reliable solution is established. What is the solution to these woes? What is the precise method to adopt to counter fluctuating electricity problems? The answer is simple. For reliable power supply, a reliable voltage controller needs to be put in place. Servostar introduces quality stabilizers based on the Servo motor technology for all your industrial needs and also residential purposes. 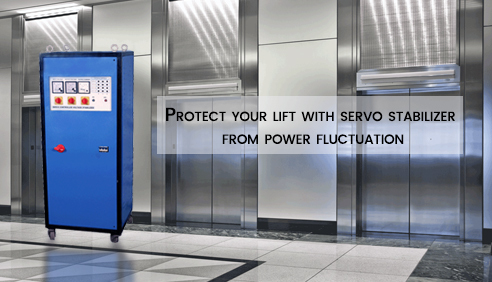 Specially designed servo stabilizers work ergonomically and economically for commercial and residential lift systems. The Servo based stabilizer is trusted over the normal stabilizer because it is a guaranteed to accurate voltage control and is a longlasting investment. Faster operation than normal stabilizers. Voltage variation of just +-1% in contrast to traditional stabilizers with +-10%. Step up and step down Servo transformers available to control higher degree of fluctuations. Reliable as they don’t use relay systems that can go wrong after a short time. Electronically controlled unit so they do not heat fast and have a longer life. Noiseless operation as there are no relays. Correct output voltage from different voltage supply. Overload protection, voltage cut-off and Low& High Voltage correction. Servo Star has become an essential part of the lift today because of its immense trust and voltage accuracy. It has silent operations that make it the no #1 choice in industrial systems. Since Servo Star always saves your precious lift motors, there is no chance of a short circuit or overload damage. Servo is not only the best choice for elevators, but it is preferred for Induction motors, AC drives, CNC Machines, CT scans, x-ray machines and a host of other computer controlled systems. Its energy saving and trustworthy performance makes Servo a Star of stabilizers.